ZAMBIA'S International chess master Lieutenant Malupande Lungu has died. Chess Federation of Zambia (CFZ) national secretary Norias Kalinga, who confirmed the death yesterday, said Malupande died on Thursday after a short illness and would be put to rest tomorrow at the Old Leopards Hill Cemetery, military site. "I am deeply saddened to inform you about the sudden death of our sportsman, chess player Lt Lungu," he said. Lt Lungu 32, died after a short illness on February 15 in Lusaka and funeral is being held at house number 5 Chelstone Green. At the time of his death, Lt Lungu was working for ZAF and a player with Red Arrows Chess Club. He was also Zone four vice chairman and a coach for up coming chess players among them, Daniel Jere, Chitumbo Mwali and Richmond Phiri. "Lt Lungu recently guided Mwali and Phiri to win gold and silver respectively at the 2006 Africa Junior chess tournament that was held in Botswana last year," Kalinga said. Malupande Lungu in action against Rahul Shetty at the Goodricke International in India. "It's a very sad development." "He (Lungu) was also awarded a FIDE trainer's certificate for best coaching student, and also received a gold and silver medal for guiding Mwali and Phiri at the same championship." Meanwhile, International Master, Mwali expressed shock at the untimely death of his mentor and friend. "The chess fraternity has been dealt with a big blow," he said. 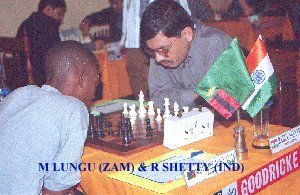 The late Lt Lungu's chess career started in the early 1990 when his late father got him an electronic chess set from India. Lt Lungu won the Mukuni Open Chess Championship in Livingstone in 2000, in the same year he represented the country at the Goodrich International Chess International Tournament in India were he put up a splendid performance and was awarded Fide Master title. The following year, he took part at the All Africa Games in Egypt and 35th Chess Olympaids in Bled, Slovenia. In 2003 Lt Lungu participated at the 8th All Africa Games in Abuja, Nigeria and won the Zimbabwe Open Chess tournament. Lt Lungu defended the Zimbabwe Chess Open in 2004. 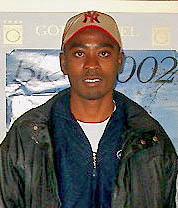 In 2005, Lt Lungu won the Botswana Open Chess Championship. Note: U.S.-based Amon Simutowe told The Chess Drum that Lungu's death was "a very sad development." Here is a game from the 2001 Goodricke Invitational against Russian IM Alexey Khamatgaleev. Zambia's 2002 Olympiad team: kneeling, from left to right, are IM Amon Simutowe (Bd. 1), Stanley Chumfwa (Bd. 2), FM Nase Lungu (Bd 3) and Tizenge Mbambara (Bd. 4); standing, from left to right, are Gershom Muzende (Bd. 5), Malupande Lungu (Bd. 6) and David Zulu (captain).